Disclaimer: The opinions below are mine alone…the numbers cited are taken directly from the Broward SOE website on the dates I wrote this report. By now most of my blog readers and those on social media know that I am from South Florida…the infamous Broward county to be exact and that she who was then Obama’s and who now is Nancy Pelosi’s little lapdog Debbie Wasserman Schultz is my Congresswoman. But most also know that for years I have fought tooth and nail for Republican candidates and for fair elections in my proven to be corrupt county and done so both in print and on Craig Andresen’s and my Right Side Patriots radio show. And while at times I have played “devil’s advocate” regarding certain candidates on the right that I have disagreed with…as in those so far to the right that they actually shake hands with the far left…as in those who will not accept that the “social issues” belong to the states and not on the federal level…I have always come at said folks with verifiable facts and numbers and not with lies, innuendos, suppositions, or through partisan colored eyes as to do so would make me as contemptible as those I will now eviscerate. And why eviscerate…because I and my fellow Floridians have simply had enough of the fraud, cheating, lies, and illegalities emanating from our respective SOE offices. And though I will concentrate on my home territory of Broward County in this article know that what I say, in most cases, is being mirrored by Susan Bucher, the SOE in Palm Beach County, just on a slightly lesser scale. Never forget Congressman Lt. Col. Allen West’s reelection bid and how that was stolen from him by her not counting the military votes and that now Bucher is refusing to comply with court orders. Now let’s start with the fact that on November 6th we Floridians voted Republican Ron DeSantis as Florida’s next governor over socialist-leaning Democrat candidate Andrew Gillum who favors sanctuary status for Florida, and we voted Rick Scott to be our new Senator, replacing Bill Nelson of the Democrat’s “good ol’ boys network.” And even though Andrew Gillum conceded to Ron DeSantis when he saw the Panhandle votes decidedly going to his opponent, Gillum is now taking his concession back. And while a concession usually means a candidate has accepted as fact that they cannot win their given race a concession while symbolic is not legally binding, but to revoke a concession is indeed highly unethical for it usually involves the candidate crying fowl as in “voter fraud” as the reason why the vote…why the voice of we Floridians…needs to be overturned. But the thing is that “voter fraud” in both Broward and Palm Beach counties is not being done by Republicans but by Democrats alone, and the fraud reaches up to the Supervisor of Elections in both counties…especially in Broward County where it lays directly at the feet of SOE Brenda Snipes…a woman as dishonest as they come yet a woman who has gotten away with her shenanigans because (I believe) she knows that the color of her skin and her gender alone will be her weapon of choice if anyone dares try to remove her. Don’t believe me…just listen to her condescending and chastising “tone” in how she talks to reporters when being interviewed on television…it’s like Brenda Snipes has one hand in her pocket ready to pull out the race card if she doesn’t like the questions being asked. First appointed SOE by Jeb Bush in November 2003 after he removed Florida’s only at that time black woman SOE Miriam Oliphant for flagrant malfeasance, Jeb (I believe) did not want the blow back of racism being leveled against him for removing Oliphant so he took both the cowards and politically correct way out and replaced Oliphant with another black women…and Snipes has been voted in time and again since then. But also remember that Governor Rick Scott had the chance to actually remove Snipes from her SOE position back in 2017 when she admitted in court, in lawsuit Case No. 16-cv-61474-BLOOM/Valle brought by the conservative legal group American Civil Rights Union, that non-citizens and felons “possibly voted,” and that there “seems to be” more voters registered on Broward County voter rolls than there are actual eligible voters. Yet Scott didn’t remove her and (I believe) he didn’t do so because he, like Jeb Bush, feared said race card being used against him in any future political aspirations he might have. Nice huh…now add in that Broward’s questionable issues raised during the trial included fraudulent voter registration lists which included on them supposed 130-year-old voters, the afore mentioned non-citizens and felons, duplicate registrations, illegal registrations, and hundreds of commercial addresses listed as residential addresses that turned out to be rented mailboxes…with Snipes knowing all and doing basically nothing about it. But the problem is that this case against Snipes and her office was not presented to the courts as a voter fraud case…as it should have been…but as a case questioning whether Broward County managed its voter records in accordance with 1993’s National Voter Registration Act…commonly referred to as the “Motor Voter Law”…the very law that has caused more problems than it solves as it allows people to register to vote when they apply for a driver’s license whether they are citizens or not. And while this law does require SOE offices to keep their voter lists accurate and up to date, Brenda Snipes apparently never did so and for now obvious reasons. And know this was not the only time Snipes has been charged with voter irregularities…here’s just a short list of the numerous charges leveled against her: in 2004 some 58,000 mail-in ballots were not delivered to voters; in 2012 roughly 1,000 uncounted ballots were discovered a week after the election; in the 2016 primary election results were posted on the elections office’s website BEFORE polls closed; also in 2016 a medical marijuana amendment was left off some ballots; and a court ruled she had broken election law when she destroyed ballots from the 2016 election 12 months after it instead of the 22 months required by federal law…the case of Tim Canova v. Brenda Snipes. Briefly, Broward Circuit Judge Raag Singhal ruled in Case No. :CASE17-010904(21) that Supervisor Brenda Snipes’ office did improperly discarded thousands of ballots cast two years ago in the Democratic primary race between Tim Canova and Debbie Wasserman Schultz after Snipes ignored and then illegally obstructed Canova’s request to copy and inspect ballots. Yet even with this ruling Snipes remained in her SOE position…after all the thought of Snipes using the race card is a powerful incentive for her being left untouched. Nothing else makes sense now does it. So now that brings us to the actual numbers…indisputable on the record numbers… numbers proving that there has been major voter fraud going on in Broward County for quite some time, and that SOE Brenda Snipes knew all about it and looked away for it served her party’s candidates and agenda well to do so. Let’s start with these latest numbers as I write this: today, three days after the midterm election, suddenly and miraculously 83,000+ uncounted votes have been discovered in Broward County with neighboring Palm Beach County also miraculously discovering 15,000 uncounted votes. And surprise-surprise…newly we thought elected Sen. Rick Scott’s margin of victory has now dropped from 57,000 votes to just 15,074 votes out of the of 8.2 million votes cast when on election night Scott held a 50.09% lead over incumbent Nelson’s 49.91%. And while Ron DeSantis’ election night tally showed a solid 1% win over Andrew Gillum, 49.8% to 48.8%…his numbers have also suddenly shrunk to but less than 1/2 of 1% point…as in 49.61% to 49.17%…thus requiring an automatic machine recount. Now separated by just 36,235 votes out of more than 8.2 million votes cast, DeSantis’ election night win was by over 55,000 votes but now has landed at 4,073,423 votes to Gillum’s 4,037,304 votes. And poor Matt Caldwell, a seventh-generation Floridian and a Second Amendment “purist,” saw his election victory stolen right out from under him as gun-control advocate Democrat Nikki Fried, who has no agricultural experience whatsoever and who coincidentally happens to be from Broward County, is for now apparently our states new Commissioner of Agricultural and Consumer Services…a cabinet level position that includes amongst its responsibilities consumer regulation, the protection of goods to market, and the issuing of concealed arms permits. Now doesn’t that last responsibility answer it all. So where have all these votes Democrats need to overturn the election come from? First, while we keep hearing the words “provisional ballots” being thrown around, the truth, I believe, is that these suddenly appearing ballots have been recently “manufactured” and lugged in by truck as the Democrats attempt to pass them off as now legitimately found but misplaced votes. And second, I believe, reported tally numbers on the SOE website and voter registration numbers have been manipulated by Brenda Snipes as well as the actual voting numbers themselves. But first as to the “provisional ballots.” A “provisional ballot” in Florida (as per Florida Statute 101.048) is a ballot cast by a voter whose eligibility to vote is either in question or cannot be verified at the polling site…many times illegal voters…with any and all questions about said voter’s eligibility having to be resolved before their vote can count. More on that in a bit. Now as to the official numbers reported on the SOE website…numbers themselves that show fraud is going on. Let’s start with the fact that when the election was over the SOE office reported that 634,000 total votes had been cast (Snipes on Friday morning changed that number to 717,000 votes cast after she suddenly found 83,000 votes that were not tallied but that’s impossible as that number does not jive with the SOE website tally numbers). And on November 9, 2018…three days AFTER the election…the Broward SOE reported that for this election there was 1,182,220 registered voters…with 593,540 being Democrats, 252,023 being Republicans, 328.868 being ‘NPA,’ and 7,789 being ‘Other’…eligible to vote. In other words 548,220 eligible voters…a bit less than half of eligible voters…did not vote in this all important election. So I guess all those ballots now being trucked over to the SOE office are some of the ballots cast by the 548,220 folks who supposedly did not vote but whose ballots are now part of the 83,000+ ballots that have “miraculously” appeared…sure they have…and these in the video below taken by Florida’s First District Rep. Matt Gaetz might well be some of those ballots. But important to remember is that to be able to register and vote in Florida you must present photo and signature identification on Election Day; be a U.S. citizen; be a Florida resident; be at least 18 years old; have never been legally judged ineligible to vote for either mental incapacitation or crime; and have not been convicted of a felony and had your civil rights restored…and yet as previously stated Snipes admitted felons and non-citizens have voted. And yet Brenda Snipes remains in her position as SOE. Notice that on August 28th…primary day in Broward County…1,152,897 people were eligible to vote with 274,038 people actually voting, as in a 23.8% turnout. Now remember that three days after the midterm election registered voters were at 1,182,220 an increase of 29,323 registered voters but with the vast majority being new Democrat voters with but a miserly 4,940 new registers going into the Republican column…that in itself is quite odd as Republican vote-getters claim they registered way more new Republicans than that. But truly odd and something that should raise a red flag is that the original number of those eligible to vote on November 6th have been taken off the SOE website to be replaced by new numbers posted three days AFTER the election…and I want to know what is the discrepancy between the pre and post election numbers and why aren’t those pre-election numbers available. What is this woman trying to hide? Also quite distressing and truly damning…in fact this might be Snipes’ very downfall…is that at 4:03 PM, November 06, 2018…three hours BEFORE Florida polls closed…Local 10 News (WPLG an ABC affiliate) reported on their website https://www.local10.com/news/election-results/nov-6-2018-broward-co…* the following election results with 100% of Precincts Reporting (577/577): FL Governor; Broward County…Democrat Andrew Gillum 67% with 480,314 votes to Republican Ron DeSantis’ 31% with 221,335 votes and U.S. Senate FL;Broward County…Democrat Bill Nelson 69% with 469,969 votes to Republican Rick Scott’s 30% and 210,599 votes. What I want to know…what I demand to know…is how and from whom did Local 10 News get these numbers three hours BEFORE the polls closed…(and nowhere does it say these are early voting numbers) I’ll tell you from whom… from “crooked” Brenda Snipes! And if ALL precincts reported in as Local 10 claims why and what the hell is Broward still counting!!! Phony, fake, and “manufactured” votes that’s what they’re counting and they’re doing so solely to overturn the election and to make Democrats the election winners!!! Something stinks folks…and stinks big! Now let’s take these numbers in the DeSantis v. Gillum race for example and compare them with the official SOE website registered to vote numbers: as per Brenda Snipes there were 1,182,220 eligible to vote in this election from Broward County and in total between these two men 701,649 votes were cast as of this Local 10 News 4:03pm post in the governors race. Now according to Snipes’ total NOT voting count of 548,220 registered voters and you subtract the 480,571 from those who did vote in this race, as per the Local 10 News post, and even if you assume that the Local 10 News post is the tally of early voters (which nowhere does it say that it is) that leaves you with a questionable 67,649 vote tally discrepancy in Snipe’s numbers, and we know damn well that way more than 67,649 people voted on election day. Translation: people voted who had absolutely NO legal right to vote. And that folks changes the entirety of the eligible to vote numbers and reduces the total number across the board of legitimate people who voted for each and every candidate. Talk about out and out voter fraud. And now we must add in that whiny Democrats are claiming that the ballot set-up itself was to blame as the Senate race appeared below the instructions and that they didn’t see it. First, the ballot itself is approved by the SOE herself…as in by the anything but should be nonpartisan SOE Brenda Snipes and second, are Democrats really that stupid as to not look to the bottom of the page as they knew well there was a Senate race. And here’s a fact that should shut them up…every voter gets a sample ballot in the mail BEFORE the election…if you didn’t get one take it up with Snipes. And that brings us back to the provisional votes…the vast majority of which are the very votes Snipes claims to have found. There’s a simple way to end her nonsense…call those voters and ask if indeed they had cast a provisional vote…I bet most have not. And I bet the same can be said about the majority of the absentee ballots as well. In other words, I would not doubt that Brenda Snipes and her staff both BEFORE the election and within these past few days AFTER the election have “bubbled-in” left over blank ballots…the now to date 83,000+ ballots suddenly found. So as the news just broke that both our senate and governors race are now subject to recounts**…as if we didn’t know that would happen…all I can say is that the fix is in and it probably was given the go-ahead when Hillary Clinton visited both Broward County SOE Brenda Snipes and Palm Beach County SOE Susan Bucher a week before the election. And I also would not doubt that Barack HUSSEIN Obama’s hand is in this as well for Obama demands payback for his being denied his third term in office via his puppet Hillary Clinton. And what better payback would there be than turning Florida blue. * As I publish this report on 11/12/18, the Local 10 News (WPLG) website is still showing the election results they posted three hours BEFORE the polls closed. ** Here’s how the Democrats will try to pull off some of the vote manipulation as in the scanner recounts of the paper ballots which can easily be defrauded. All someone has to do is fill in (bubble in) the box of the Democrat candidate where the original ballot had the Republican candidate marked. The machine will now recognize it as a double vote and reject it, thereby eliminating the original Republican vote. 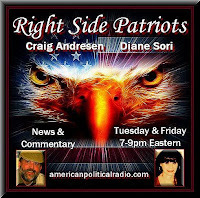 Tuesday, November 13th from 7 to 9pm EST on American Political Radio, RIGHT SIDE PATRIOTS Craig Andresen and Diane Sori discuss ‘Votes Manufactured Not Found’; ‘ A Trifecta of Nuts in the News’; and important news of the day.